amydame sculptures are all one-of-a-kind handmade artworks made with a variety of fabrics. 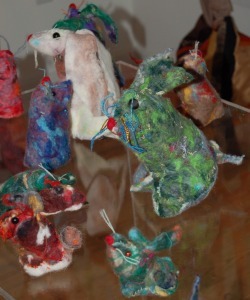 Dust bunnies are made of reclaimed or hand (wet) felted wool, often with needle felted and appliqued details. Larger works are made with a variety of armatures, and are more often than not life sized. Mostly mammals, there is a leaning towards African animals, including lion, elephant, alligator and the many varied members of the antelope family. New ones are always being created, and can be made to order.